Yolo County Supervisor Don Saylor stands out as an uprail public official committed from early on to stopping the dangerous transport of crude oil through our natural habitat and populated areas. He wasted no time in directing his staff to research and compose a letter insisting that uprail concerns had to be addressed in the EIR. On the draft EIR, Yolo County wrote a second letter detailing the impacts of the unsafe oil trains, and when the response was inadequate, added a third letter response to the revised draft EIR. Meanwhile, as President of Sacramento Area Council of Governments (SACOG), Don Saylor also led the 22 cities and 6 counties of SACOG to respond to the regional threat of oil trains with a series of hard-hitting letters during the EIR process. His deep concerns even took him to Washington DC where he conferred with our local Congressman John Garamendi on stabilizing crude at the loading site as perhaps the only acceptable method of making the Bakken crude safe to transport by rail. Don continues to monitor the volatile issue closely, as 500,000 of the 2.4 million SACOG residents live at risk in the blast zone. Most recently, he took time to testify before the Benicia City Council in hopes of convincing them of the enormous impacts to uprail communities and to our state. We are fortunate to have such a diligent public official. While an independent PAC of outside oil corporations including Valero as well as other PACS have intruded with huge campaign contributions to one candidate for the District 4 Assembly race (including Lake and Napa Counties, most of Yolo County, and part of Colusa, Solano, and Sonoma Counties ), Don Saylor has not been chosen for such outside support. If elected, we can count on Don to work and vote as he always has for programs that benefit our region. 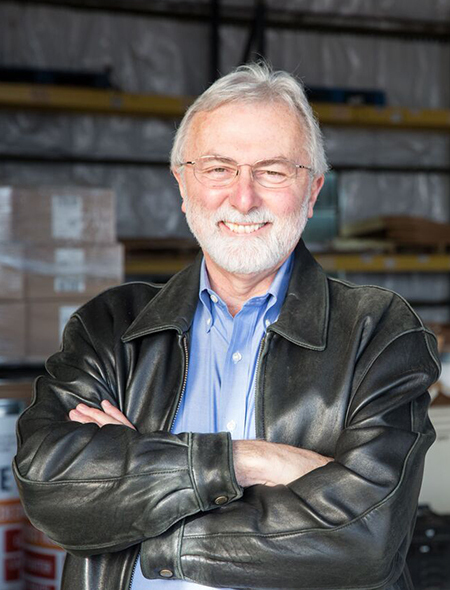 Don Saylor will continue to keep a watchful eye on oil trains if he is elected to the CA Assembly. Opponents of Valero’s oil train proposal rallied in front of city hall before the Benicia City Council hearing. 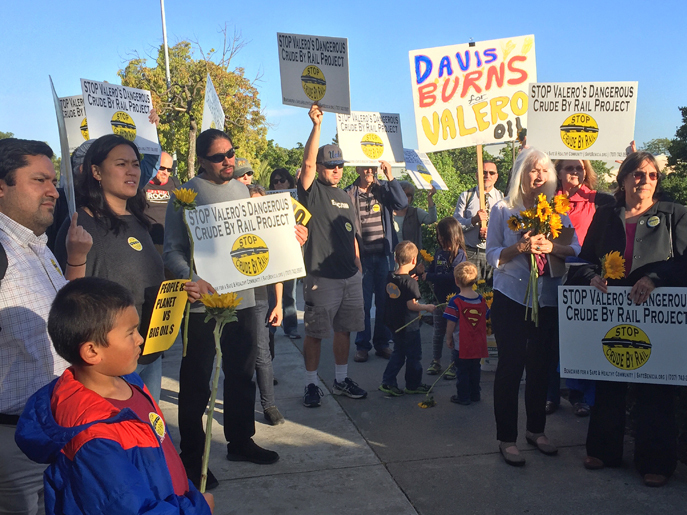 On April 4, scores of concerned Californians converged on Benicia City Hall to urge the city council to reject Valero’s plan to transport volatile crude to its Bay Area refinery in dangerous oil trains. In February, local planning commissioners unanimously rejected the proposal, which would send two 50-tanker oil trains through California communities each day. Valero appealed that decision to the city council. Given the intense public interest in the crude-by-rail project, the city council has scheduled four public hearing dates this month. Before Monday’s city council hearing began, opponents of Valero’s dangerous plan held a rally in front of city hall. Rally speakers included Berkeley City Councilmember Jesse Arreguín and Andres Soto of Benicians for a Safe and Healthy Community, as well as a local business owner and a senior scientist from Communities for a Better Environment, an environmental justice organization. 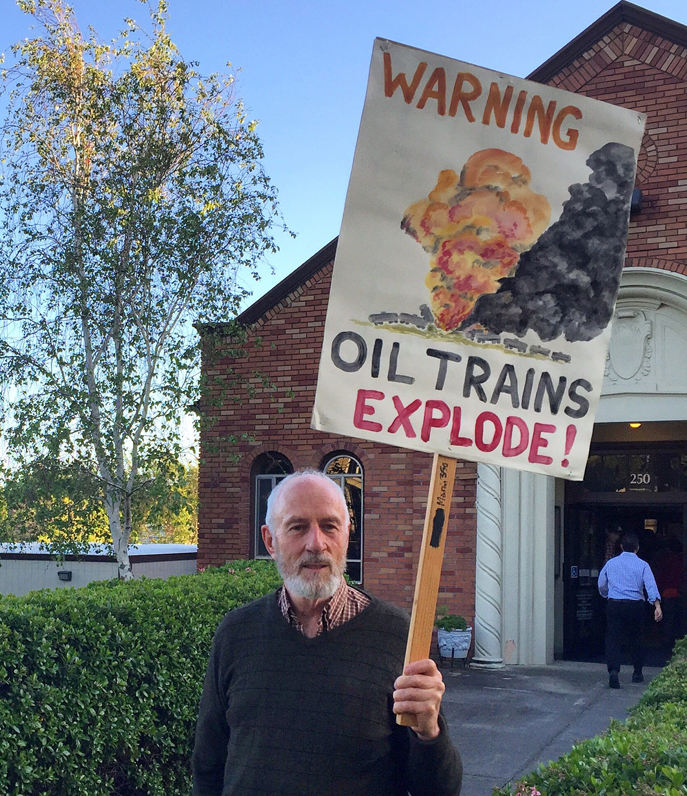 Benicia residents were joined by members of “up-rail” communities (including Sacramento and Davis) who would be endangered by the oil trains rolling through their cities and towns on the way to the Valero refinery. Oil train derailments and explosions have skyrocketed in recent years — including the July 2013 derailment in Lac-Megantic, Canada that killed 47 people and obliterated several city blocks. Berkeley City Councilmember Jesse Arreguín addressed the crowd at the rally outside Benicia City Hall. Inside the city council chambers, public comment began with testimony by a series of elected officials and agency representatives concerned by the risks posed by Valero’s oil train project. Speaking on behalf of the Sacramento Area Council of Governments (which represents six counties and 22 cities), Yolo County Supervisor Don Saylor urged the Benicia City Council to consider impacts on up-rail communities, including the 260,000 people in the Sacramento region who live within a quarter-mile of the railroad tracks. A representative from the Sacramento City Unified School District noted that 17 schools in the district are within the “blast zone” that would be put at risk by explosive oil trains on the railroad tracks. Other speakers included Berkeley Vice-Mayor Linda Maio and representatives testifying on behalf of up-rail air quality management districts, the City of Davis, and State Senator Lois Wolk. 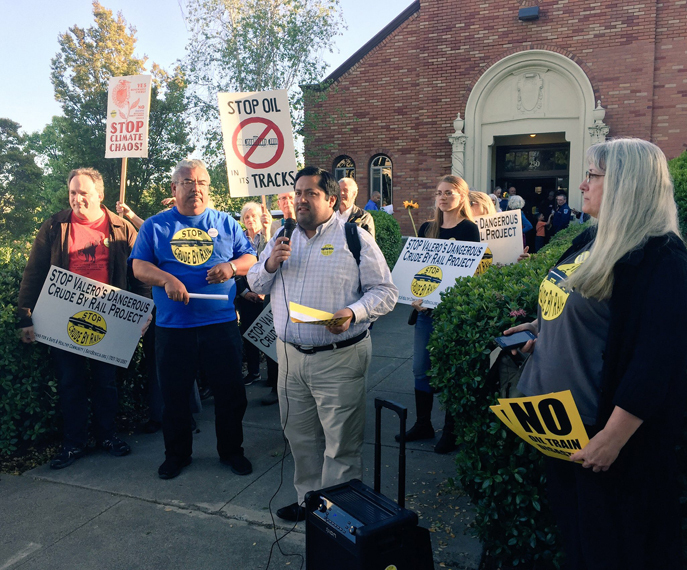 After the elected officials and agency representatives spoke, residents of Benicia and up-rail communities voiced their concerns about the severe public health and environmental risks posed by Valero’s proposal. Although a few people expressed support for the project, the majority opposed it. 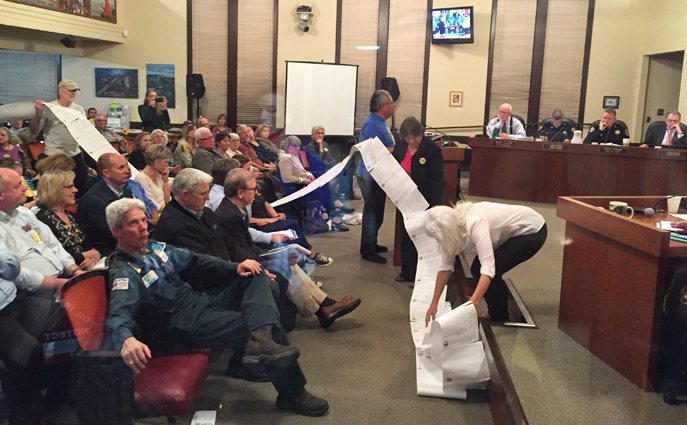 Benicians for a Safe and Healthy Community presented the city council with a petition — compiled along with the Sierra Club, Stand, CREDO, Center for Biological Diversity, and 350 Sacramento — with 4,081 signatures of people opposed to Valero’s oil train project. Benicians for a Safe and Healthy Community presented the city council with a petition signed by over 4,000 people who are opposed to Valero’s oil train project. In addition to urging the Benicia City Council to uphold the permit denial, many speakers urged the council to reject Valero’s request to delay the appeal process. At a city council meeting last month, Valero unexpectedly asked the council to put the appeal on hold while the company seeks a declaratory order from the federal Surface Transportation Board regarding the scope of the legal doctrine of preemption. Valero has insisted that federal regulation of railroads means that Benicia is prohibited from considering the project’s impacts on communities and sensitive environments along the rail line (including derailments, oil spills, and explosions). At the Benicia Planning Commission hearings in February, attorneys from the Sierra Club, Natural Resources Defense Council, and the Stanford Law School clinic refuted this expansive interpretation of the preemption doctrine, and the commissioners ultimately rejected Valero’s interpretation as overly broad. Notably, the California Attorney General has previously weighed in on the shortcomings of the city’s environmental review, and specifically noted the failure to adequately analyze impacts to up-rail communities. Valero has not offered a compelling rationale for why the Attorney General would request that analysis if preemption renders those impacts irrelevant. The oil industry’s self-serving interpretation of preemption was also recently rejected by planning staff in San Luis Obispo County, who recommended denial of a similar oil train proposal at a Phillips 66 refinery due in large part to the environmental and health impacts along the rail line. In a letter submitted to the Benicia City Council last week, the Sierra Club and our allies explained why federal law does not preempt Benicia from denying the permit for Valero’s project. The letter also reiterated that the project’s local impacts, especially increases in refinery pollution, require the city to deny the permit. For years, the Sierra Club and our partners have pushed back against Valero’s efforts to hide the true impacts of its oil train proposal — including submitting comments at each stage of the environmental review process. Our allies in these efforts include NRDC, Benicians for a Safe and Healthy Community, Stand (formerly ForestEthics), Communities for a Better Environment, Center for Biological Diversity, SF Baykeeper, and Sunflower Alliance, among others. Additional city council hearings are scheduled for April 6, 18, and 19, as needed for public comment and council action. Rallying in front of Benicia City Hall. BENICIA — Davis was well-represented at a Benicia City Council hearing Monday for Valero Oil’s crude-by-rail project. Of the approximately 48 people who spoke, 12 came from Davis or Dixon, and another six were from Sacramento. The speakers voiced their opposition to the oil company’s proposal to expand its refinery and accept 100 rail cars daily full of North American crude oil on a route that comes directly through downtown Davis. The hearing continues with more public testimony tonight plus April 18 and 19 at the City Chambers in Benicia. The evening began with a rally of those opposed to the project counter-balanced by a gathering of Valero workers and supporters of the project. A busload of 23 people from Sacramento stopped to pick up seven more in Davis, arriving just as the hearing began in the packed chambers. Officials were allowed to speak first, beginning with Yolo County Supervisor Don Saylor, who also represented the Sacramento Area Council of Governments. He traced Yolo County’s effort over the past three years to communicate the serious safety concerns and to offer possible mitigation measures that were acknowledged but not addressed in the EIR. He said 500,000 of the 2.4 million residents in the SACOG area — the counties of Yolo, Sacramento, Sutter, Yuba, Placer and El Dorado — live in the blast zone of the railroads, i.e., within a quarter-mile radius of the tracks. Of those, 260,000 are residents, 200,000 work in the area and 28,000 are students. While acknowledging that Valero and its jobs are important, Saylor emphasized that this project “requires a shared commitment to protecting public safety.” He said the project should not be approved until the safety concerns are resolved. Matt Jones of the Yolo Solano Air Quality Management District represented all seven districts that have responded jointly in writing to three versions of the environmental impact report for the Valero project. He said the EIR documents the impacts correctly, but fails to offer or respond to any mitigations, even when the Sacramento Metropolitan AQMD offered staff time to work out an off-site mitigation plan. Jones reminded the Benicia council that San Luis Obispo County is examining a similar crude-by-rail proposal, and Phillips 66 has voluntarily offered such off-site mitigations. Eric Lee, a city of Davis planner, made a plea for Benicia council members to uphold the decision of their Planning Commission, which voted on Feb. 11 not to certify the final environmental impact report and denied Valero’s permit. He added that Davis believes that legally, the local jurisdictions are not pre-empted by federal rail regulations and that up-rail cities are entitled to have their comments addressed in the EIR. He concluded by saying that the city of Benicia has a legal obligation to safeguard the public. “I continue to be concerned about the Valero crude-by-rail project regarding the significant air quality impact,” state Sen. Lois Wolk, D-Davis, wrote in a letter to the Benicia council, read by her representative, Alex Pader. Wolk recommended specific steps, and if said they cannot be met, then the project should not move forward. She reminded the council members that her own obligation is to protect the public from harm, which she has done with two pieces of legislation on oil-train safety, and said their obligation to safeguard the public is no less. Marilyn Bardet, spokeswoman for Benicians for a Safe and Healthy Community, encouraged the council members to use their ethical judgment, and read all the material from the past years, plus what is pouring in now, to inform themselves at this crucial juncture in the decision-making process. She urged them to uphold the decision of the Planning Commission. After a break, a mix of speakers pro (12) and con (16) spoke for up to five minutes each. One Valero proponent said America has a tremendous thirst for oil; therefore, don’t we have a responsibility to produce it? Jasmine Powell, a resident of Benicia, said Valero never risks its outstanding safety record as indicated by its high OSHA ratings. Michael Wolfe, senior vice president of an engineering services firm, said California crude is increasingly scarce and Alaskan crude is running out as well. Valero is seeking to purchase North American oil to avoid importing more foreign oil. California already imports more foreign crude than any other state, Wolfe said. Seven other Valero workers and supporters spoke of their trust in Valero’s high safety standards. On the other side, Frances Burke of Davis spoke of the Planning Commission’s work as “epic,” and made an eloquent plea for the up-rail communities not to be dismissed as collateral damage. Don Mooney , an environmental lawyer from Davis, said in his 25 years in environmental law, he had not seen a case with more uniform opposition, where so many have stood opposed for the same reasons. Katherine Black simply read the list of officials and organizations opposing the project for five minutes, including all seven air quality management districts, all 22 cities and six counties who belong to SACOG, the California Office of Spill Prevention and Response and the California attorney general. The Benicia City Council will hear more testimony tonight.